• Master #1 (first floor) King bed and twin air mattress, TV, private bath with jetted tub and separate shower. 10’wide slider that opens onto deck with mountain views. • Master #2 (first floor) King Bed with twin air mattress, private bath oversized shower. 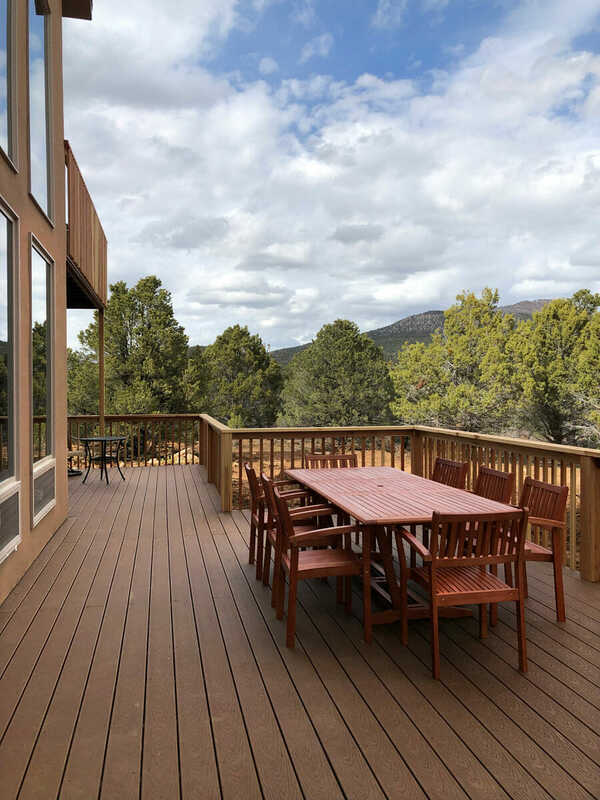 10’ slider that opens onto deck with mountain views. • Master #3 (second floor) King Bed with twin air mattress, private bath. 10’ slider that opens onto private upper balcony with best mountain views. • Bedroom #5 (second floor) Two Twin Beds – can be setup at 2 twins or pushed together for king, along with private attached bath. • Loft – Daybed with trundle (2 twin beds) & pull out full size sofa bed. • Living Room – Two story gas fireplace with 65”TV, leather sectional couch plus a Queen sofa bed & mountain views. • Deck has hot tub and table with chairs for dining and lounging. This is a new home. .